When you double-click a file it will open in the default application, which is fine for most situations. Often, each file format corresponds to a single application. Word documents open in Microsoft Word, MP3s open in iTunes and movies open in Quicktime Player. But there are times when you might want a file to open in a different application. For example, you might want a image to open in Photoshop rather than Preview, or a Word document in TextEdit instead of Microsoft Word. In this situation, you have a few options. Firstly, if the application is in the Dock, you can simply drag the file onto its icon in the Dock. Alternatively you can open up the application first, and choose "Open" form the File Menu. A third method is to use the "Open With" menu. You will find this by right-clicking (Control-clicking) on the file and looking near the top of the contextual menu. 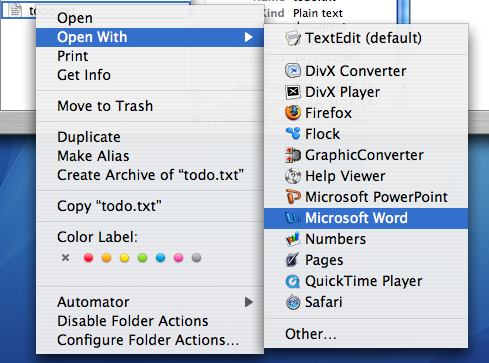 Within the Open With submenu you will find every application that can open the file, as well as an "Other" option. When you use the Open With menu, it is a "this time only" thing. Next time you double-click on the file, it will open with the default application again. To change the default application, bring up the menu as before, but hold down the Option key before choosing the application. The menu should change to "Always Open With". When you use the Always Open With menu, it is a "this file only" thing. To apply a new default application to all files of that format, you can use the Get Info window located in the File Menu. In the Open With section, set the new application and click the "Change All" button. To reset all of your files to open with the original default application, you need to delete a certain file. Go to your user folder, and navigate into the Library folder then into the Preferences folder. Find the com.apple.LaunchServices.plist file, and drag it to the Trash. Alternatively, drag it to the Desktop if you think you might change your mind and want to put it back later.